Whether giving or receiving, forgiveness is the key toward true healing and blessing. God says there are no limits to forgiveness toward others or ourselves. And when Matthew West set out on a journey asking people to share their true life stories, Renée shared about how she chose to forgive the drunk driver who hit and killed her daughter. This remarkable story and others like it bring peace and healing to the one needing and the ones giving forgiveness. Fifty powerful stories share forgiveness through divorce, betrayal, addiction, abandonment, death, and more. Each story ties into the promises of God’s faithfulness and healing, and ends with the story of God’s ultimate forgiveness through the message of salvation. If there is one thing i'm good at, it's holding a grudge. Actually, I might even be considered a professional grudge holder. Forgiveness, no matter who it is directed to, is something that just doesn't come easily to me. But over time I've learned a very important lesson, a lack of forgiveness hurts you more than it hurts the other person. This is such a beautiful book filled with stories of real people struggling with forgiveness. Forgiveness, either for them selves or for others. It’s a small book but don't be deceived by it's size. It's packed with awesome stories of real people. So many of these stories resonated with me and I found myself asking questions. Am I really a forgiving person now? Are there people I need to forgive for the wrongs they've done to me? Forgiveness will wake you up to reality. If you are struggling with forgiving others or yourself, then this book is for you, my friend. It will open your eyes and help you realize that it is not impossible to forgive the wrongs. Forgiveness isn't easy, not at all. But it’s what God has commanded us to do. One reason we resist forgiving is because we don't really fully understand what forgiveness is or how it works. 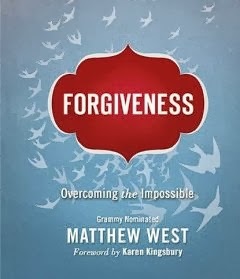 West points out that there is a difference between forgiveness and acceptance. It’s possible to forgive an abuser, for example, without accepting the abuse any further. Most of us (myself included) think that if we forgive our offenders, they are off the hook. Or if we forgive them it shows weakness on our part. Forgiveness means you can let go of the anger. It doesn't mean you condone what they did or let them do it again. It’s an important distinction and one that people sometimes miss. Once you learn the way of forgiveness, you won’t have to spend all those hours turning over the past, replaying the wrongs someone has done you, holding on to the pain as though it were your best friend. This book was provided to me free of charge by booksneeze.com in return for my honest review. The opinions i have expressed are my own.